My ignorance towards street-art is possibly because it is almost non-existent in South Africa as an art form. And now I am coming across more and more artists who have their roots in some form of street art. There are different names: “interventions” “crashing” “culture jamming” “graffiti” “guerrilla art” “installation art” “spray-paint art” etc. etc. In essence it is mostly unsanctioned art developed in public places. 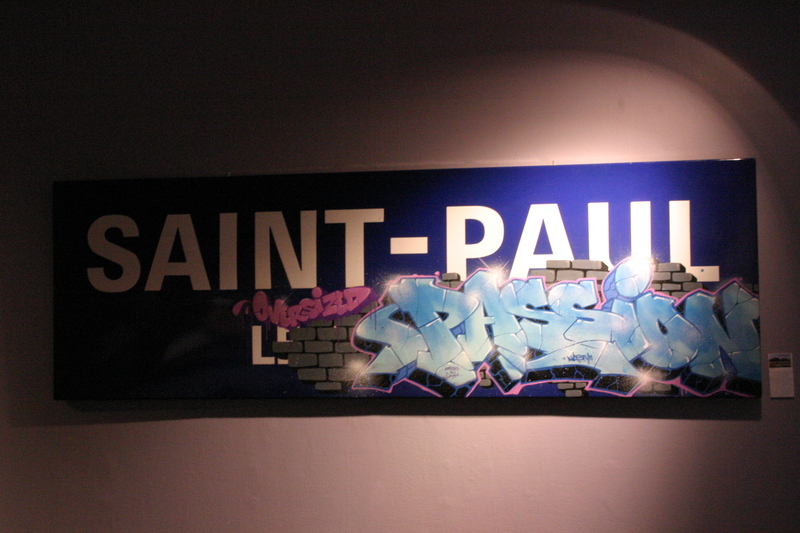 But many artists have bridged the gap between their street art and art made for the gallery, thus for public consumption. One of the galleries I visited is the newly opened ALEXANDRE LAZAREW gallery, where the owner was present to talk about his passion for street artists. I forgot to write down the names of the artists who’s paintings i photographed, but they referred me to another gallery that is currently showing the work of SWOON, who does really beautiful stuff. 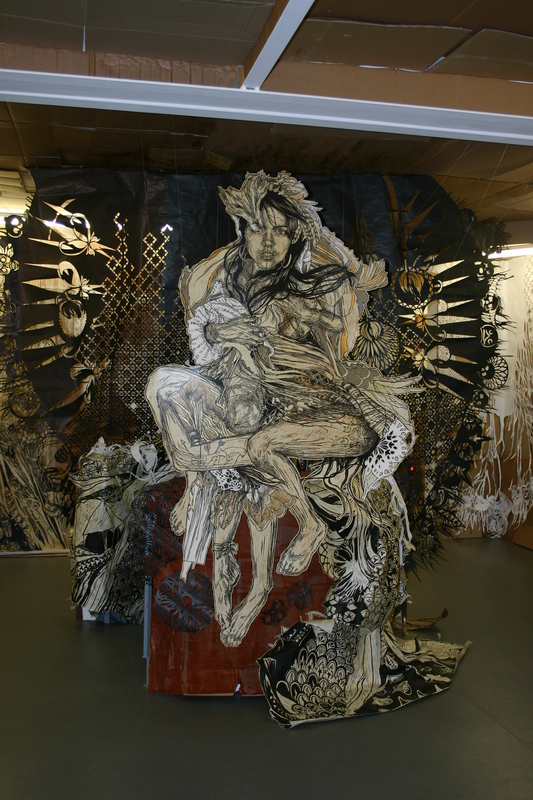 SWOON (Caledonia “Callie” Dance Curry) is an American artist working in New York. 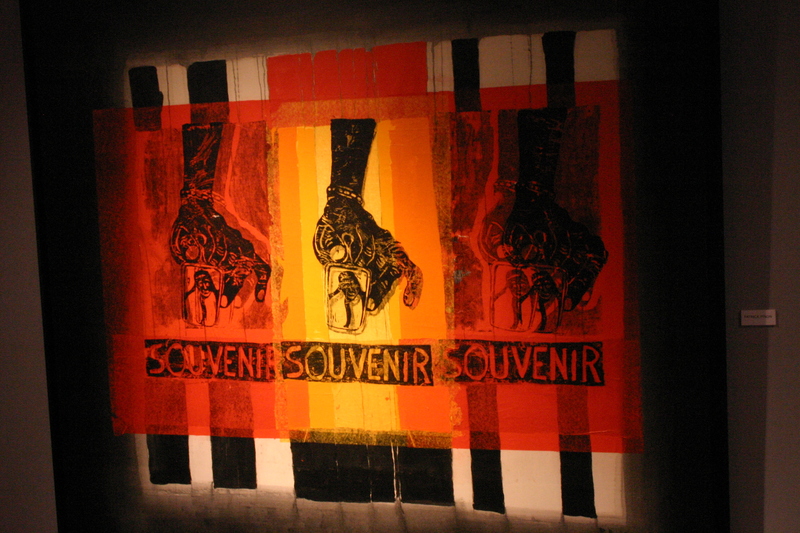 Her style is strongly influenced by the German expressionist woodblock prints and Indonesian shadow puppets. 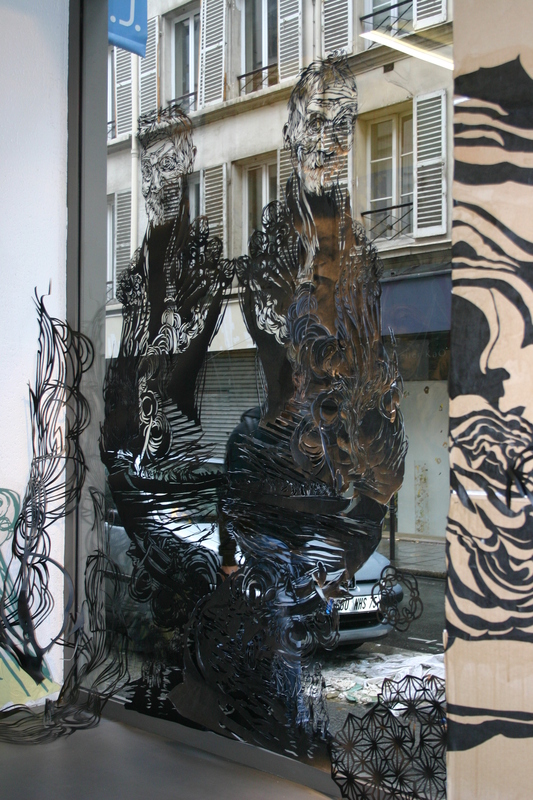 She makes large-scale paper cut-outs (very finely done, see the photo of the cut-out in the gallery window) which she then pastes with wheat-paste (also called “marxist glue”) onto surfaces in public spaces, or onto her canvasses (it looks as if she also sprays over the cut-out onto the canvas) for galleries. 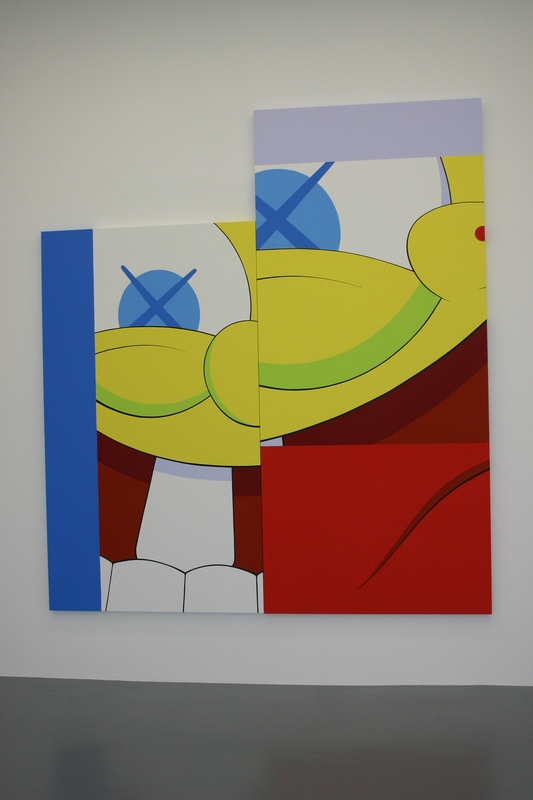 Then, at the High-end gallery EMMANUEL PERROTIN, I came across the work of KAWS (note that these artists all retain their street-art names) who started his career as street-artist by subverting advertising imagery on billboards, bus shelters and phone-booths. People were removing these reworked posters, and this led him to start making limited-edition vinyl toys that were especially successful in Japan. More toys and clothing under the label “Fake” followed. After a stint working for disney, he developed his own takes on eg. Micky Mouse with a pirate face. 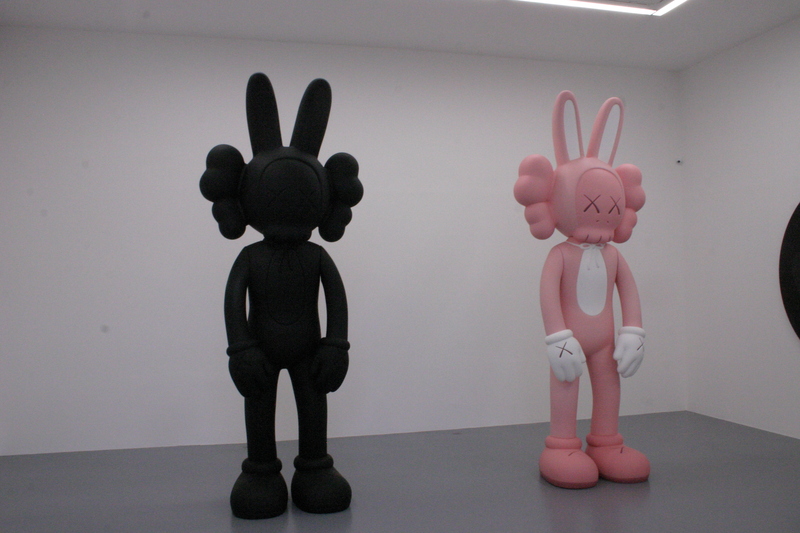 Kaws has successfully blurred the line between fine art and mass-produced merchandise. His large canvasses all depict recognizable images ,but the are cut up and made abstract. I really really liked the paintings.